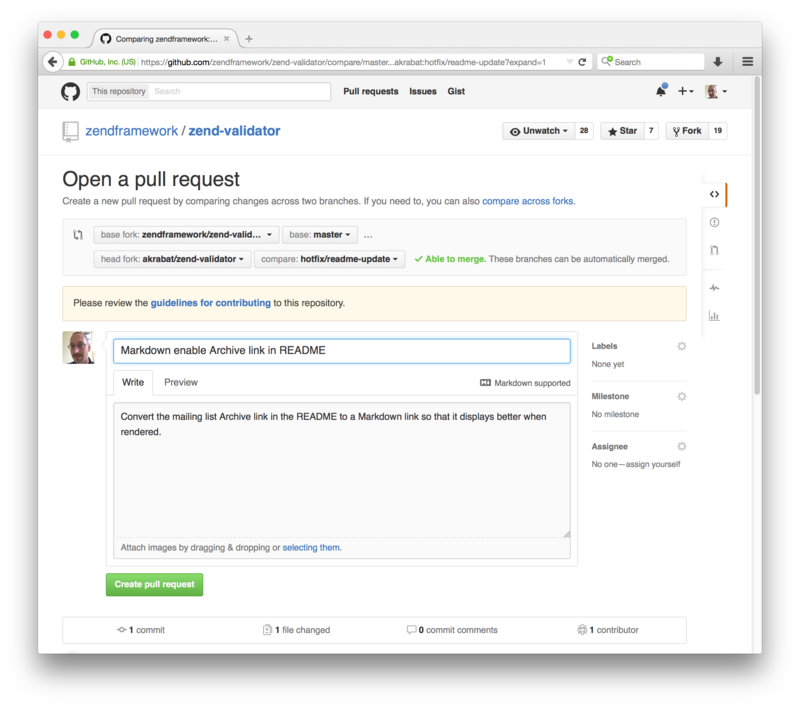 A general guide to setting up, working in, reviewing, and branching open source GitHub projects. This is a guide to contributing to an open source project that uses GitHub. It's mostly based on how I've seen Zend Framework, Slim Framework and joind.in operate. However, this is a general guide so check your project's README for specifics. Finally, in this stage, you need to set up a new remote that points to the original project so that you can grab any changes and bring them into your local copy. Firstly clock on the link to the original repository – it's labeled "Forked from" at the top of the GitHub page. This takes you back to the projects main GitHub page, so you can find the "SSH clone URL" and use it to create the new remote, which we'll call upstream. origin which points to your GitHub fork of the project. You can read and write to this remote. upstream which points to the main project's GitHub repository. You can only read from this remote. This is the fun bit where you get to contribute to the project. It's usually best to start by fixing a bug that is either annoying you or you've found on the project's issue tracker. If you're looking for a place to start, a lot of projects use the "easy pick" label (or some variation) to indicate that this issue can be addressed by someone new to the project. The number one rule is to put each piece of work on its own branch. If the project is using git-flow, then it will have both a master and a develop branch. The general rule is that if you are bug fixing, then branch from master and if you are adding a new feature then branch from develop. If the project only has a master branch, the branch from that. Some projects, like Slim use branches named after the version number (2.x and 3.x in Slim's case). In this case, pick the branch that's relevant. Firstly we ensure we're on the master branch. Then the git pull command will sync our local copy with the upstream project and the git push syncs it to our forked GitHub project. Finally we create our new branch. You can name your branch whatever you like, but it helps for it to be meaningful. Including the issue number is usually helpful. If the project uses git-flow as zend-validator does, then there are specific naming conventions where the branch is prefixed with "hotfix/" or "feature/". Now you can do your work. Ensure that you only fix the thing you're working on. Do not be tempted to fix some other things that you see along the way as your PR will probably be rejected. Make sure that you commit in logical blocks. Each commit message should be sane. Read Tim Pope's A Note About Git Commit Messages. To create a PR you need to push your branch to the origin remote and then press some buttons on GitHub. This will create the branch on your GitHub project. The -u flag links this branch with the remote one, so that in the future, you can simply type git push origin. Go ahead and press the button! Click the link which will take you to the project's CONTRIBUTING file and read it! It contains valuable information on how to work with the project's code base and will help you get your contribution accepted. On this page, ensure that the "base fork" points to the correct repository and branch. Then ensure that you provide a good, succinct title for your pull request and explain why you have created it in the description box. Add any relevant issue numbers if you have them. If you scroll down a bit, you'll see a diff of your changes. Double check that it contains what you expect. Once you are happy, press the "Create pull request" button and you're done. For your work to be integrated into the project, the maintainers will review your work and either request changes or merge it. Lorna Mitchell's article Code Reviews: Before You Even Run The Code covers the things that the maintainers will look for, so read it and ensure you've made their lives as easy as possible. Fork the project & clone locally. Create an upstream remote and sync your local copy before you branch. Branch for each separate piece of work. Do the work, write good commit messages, and read the CONTRIBUTING file if there is one. Push to your origin repository. Create a new PR in GitHub. Respond to any code review feedback. If you want to contribute to an open source project, consider joind.in!